Rane Empath Grand Master Flash Signature Edition DJParts - All Variety of Parts that DJ Needs. Rane Empath Grand Master Flash Signature Edition. The Empath mixer combines the vision of Grandmaster Flash and Rane technology. Compact size, exceptional performance and advanced features set the Empath mixer apart. The Empath is the most able 3-channel, 10" format mixer available. The name implies: understanding, awareness and sensitivity to the needs of DJs. Universal internal power supply. When traveling, finding power supply adapters is difficult. The Empath accepts 100 to 240 VAC, 50/60 Hz power, for use anywhere in the world without adapters. FlexFX is a post-fader external stereo effects loop with individual Dry/Wet pan controls for Mic and Input Channels 1, 2 and 3. Penny & Giles faders are simply the best money can buy. Smooth, accurate and reliable mixing is made possible by employing the most respected name in audio faders. Two kinds of fader caps are provided for different mixing preferences: soft rubber caps for smooth mixing, and hard plastic caps for fast mixing. 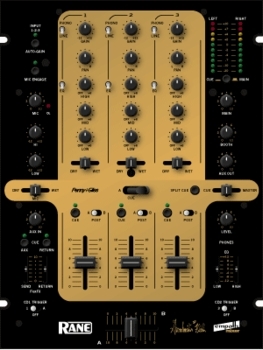 Flash-Cue allows the DJ to rapidly select Crossfader A-Cue-sum or Crossfader B-Cue-sum with the flick of a switch, normally slow or complicated on other mixers. Multiple Outputs. Nothing is more frustrating than arriving at a club and finding their jacks don't match. Systems may have XLR, TRS or RCA connectors. The Empath provides all three. Low and High headphone tone controls allow the DJ to match their mixer to their headphones. Both 3.5mm and 1/4" headphone jacks are simultaneously usable. More headphones are compatible with the Empath. Accelerated-Slope, full-cut, 3-band tone controls are the most flexible and highest quality available. Crossfader assign switches allow any Input Channel to be mixed on the A-side, B-side or Post Crossfader. Level meters view Stereo Cue, Stereo Master Mix, Split Cue or Main Output signals. All of these features are wrapped in the smallest, most portable chassis of any three-channel mixer. Excellent control ergonomics allow this small package to feel as open and comfortable as much larger units.